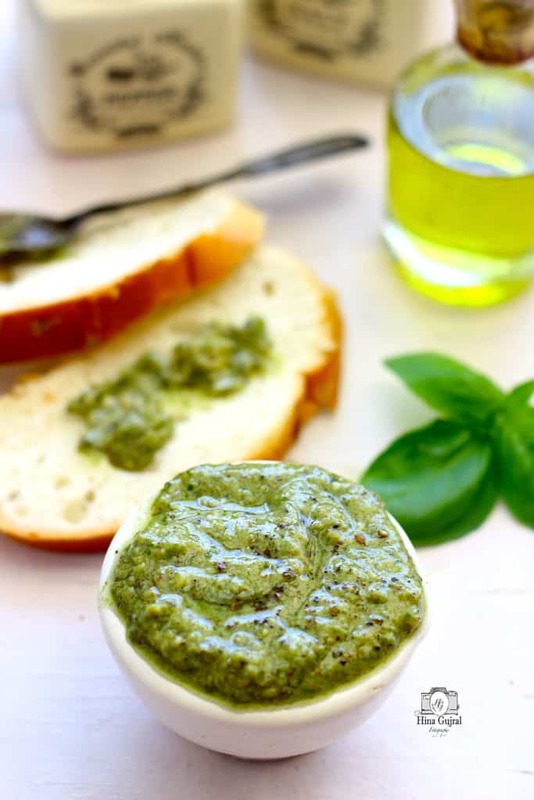 This easy, creamy pesto sauce recipe is absolutely bursting with fresh basil flavour.The word Pesto has come from an Italian word “Pestare” which refers to pound or crushed in a marble mortar with wooden pestle. 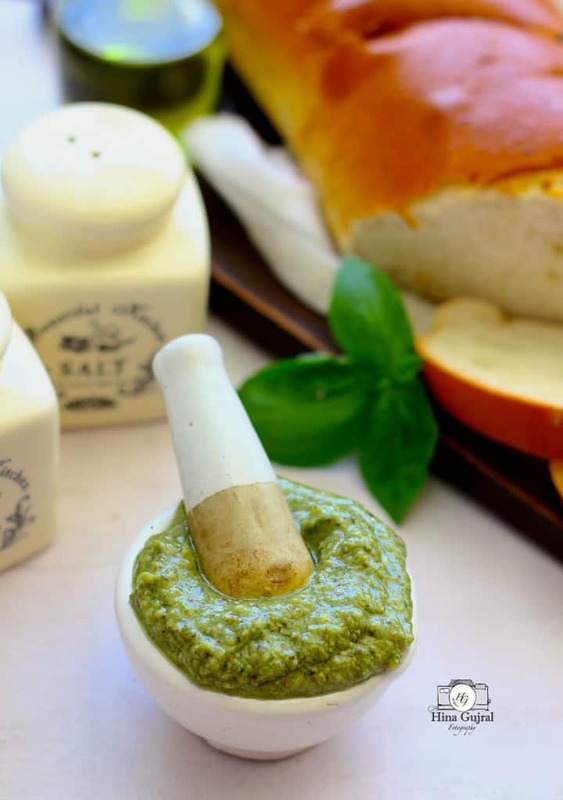 The pesto sauce is traditionally prepared in a mortar and pestle. 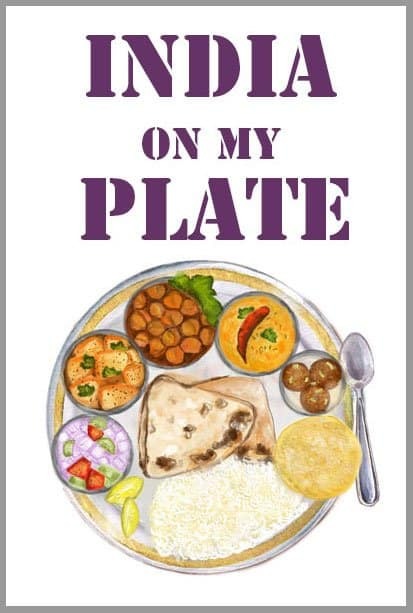 First, garlic and pine nuts are placed in the mortar and reduced to a cream, then the fresh basil leaves are added with a coarse salt and ground to a creamy consistency. Only then is a mix of Parmigiano-Reggiano and supreme quality olive oil is added to the pesto sauce. 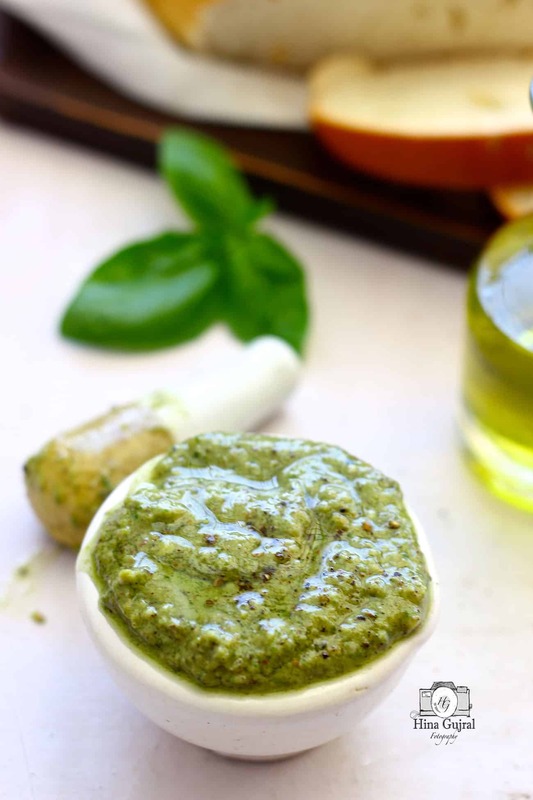 If you enjoy Italian food, then you would surely fall in love with this herby magical sauce. The basil pesto can take even the most mundane pasta to the level of a sublime dish. Toss some delicate pasta in the pesto sauce or spread it generously over a the slice of baguette, either way it tastes delicious. Every Italian family has their own secret recipe of Pesto, which is passed on from one generation of cooks to another as a legacy. 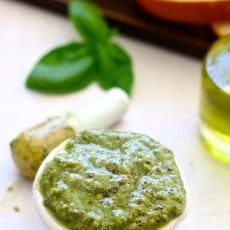 The one thumb rule for making the basil pesto sauce is that there are no rules, use your creative skills to prepare a batch with ingredients of your choice. The dry Monterey Jack or cheddar can be used instead of Parmesan Cheese. When it comes to nuts you can pick from pine nuts to pistachios, walnuts, hazelnuts or combination of any of these. To make pesto sauce, rinse and dry the basil leaves by spreading in a kitchen towel. Heat a frying pan over medium heat. Dry roast the walnuts for 1 - 2 minutes. Turn off the heat. 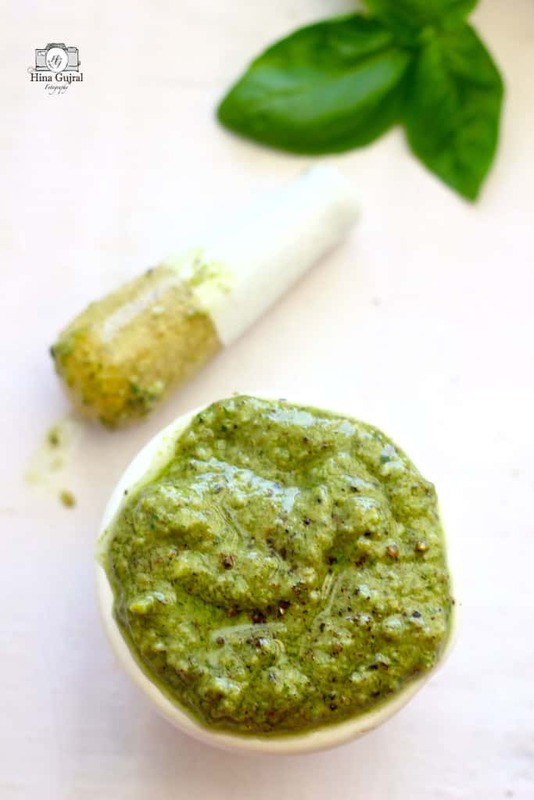 Put all the ingredients for making pesto sauce in a food processor or blender and pulse until smooth paste is formed. Store Pest Sauce in a clean and dry jar in the fridge or use it immediately. Pesto Sauce will keep in a fridge for up to two weeks. Thank you for such kind words Tara. Walnut we use as dry fruit that we have to use for pesto sauce ?? It won’t taste bitter? ?